As you may have heard, or seen on some of my social media posts, I am in the first phase of the Atkins 40 Diet. What is Atkins 40? Basically, Atkins 40 the new Atkins that lets you have more (healthy) carbs, even from the start. 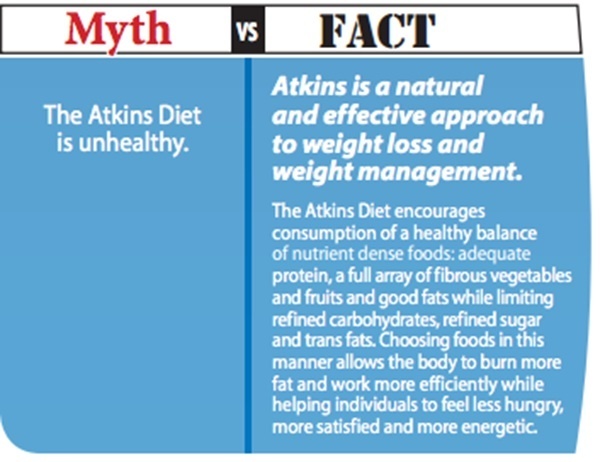 You may think of Adkins as the no-carb diet, but Atkins has changed over the years, and is also misunderstood (I admit I was one of those people). An all-too-common misconception is that this first phase of Atkins is the whole program, but the key to Atkins is finding the maximum number of grams of carbs, known as your personal “carb balance”, that you can consume while continuing to lose weight, keep your appetite under control, and stay alert and energized. In this first phase, the Atkins 40 allows you to start the Atkins program with 40 grams of Net Carbs, which is a new entry point into the program. This means you can eat from all food groups from day one on the program, and still enjoy the weight loss success on a fat burning metabolism. 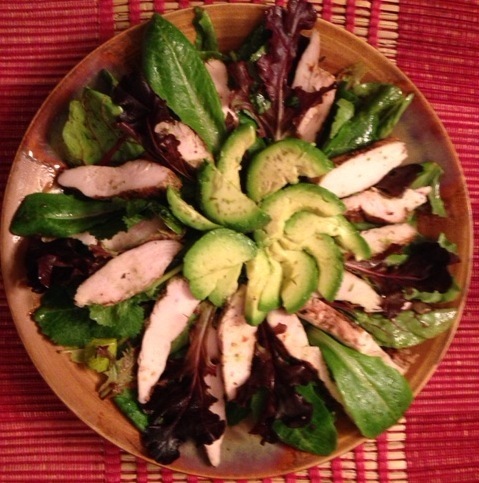 For example, I ate 2 cups of spring mix, 6oz of chicken, ½ an avocado and balsamic vinegar. My total carbs was 25.3gms of carbohydrates and my fiber was 8.8gms of fiber, totaling only 16.5gms of Net Carbs for that meal. By labeling carbs, and getting dieters to really look at fiber too, it teaches you the us the difference good carbs vs bad carbs. Net Carbs vs Total Carbs. 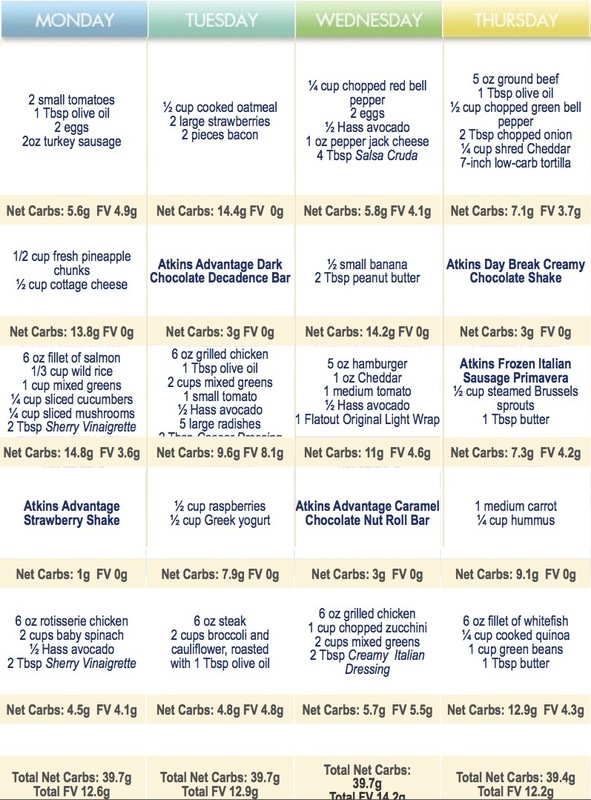 Download the Atkins Carb Counter to help you track your carbs. How to lose weight, feel great, while enjoying healthy delicious foods with a wide range of food choices. I honestly can say I have really enjoyed my meal plan. It isn’t much different than I have been eating, which is higher in protein and lower in carbs, with a good dose of healthy carbs. I only had to make a few minor adjustments. 1. I can eat BACON!! Yahoooo!! (granted, I can only have 2 pieces occasionally, this has been like striking gold for me!! YUM!). 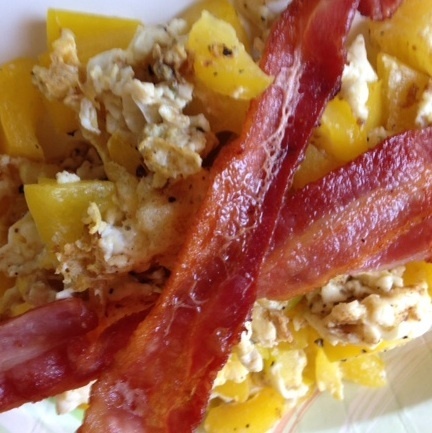 This was my breakfast yesterday – 2 eggs scrambled with bell pepper and 2 strips of bacon. What’s funny is I don’t even like eggs, but anything tastes amazing with Bacon! haha! 2. I am eating more meat. Instead of eating 3-4 ounces of chicken, I’m now eating 6 ounces!! This has definitely helped me stay fuller longer and is helping me get the protein I want with very little supplementing. 3. I am reducing my carbs a little. Since I already don’t eat a lot of carbs, this wasn’t a big shocker (even though I admit I was a little freaked out about having only 50gms of carbs a day!). Truthfully, I have been just fine without them. When I normally would want some popcorn, I cut a few slivers of some light sharp cheese and nibbled on that instead. It satisfied my salty craving and my growling tummy. 4. I am paying more attention to fiber. I have always known fiber is good, but I’ve never tracked it as much as now. 5. I am being more generous with fats. Normally, I would barely drizzle a teaspoon of oil on a salad (if I used any at all! ), but now I fill up that entire tablespoon of olive oil! I used to only eat egg beaters, but now I’m eating one whole egg with 1 egg white (even though it says I can have 2 whole eggs – I’m working my way up to that. lol). 6. I am eating more simply. Now that I am following a diet plan, I am using fewer ingredients and making better choices than even before. Following the Atkins Diet is teaching me to be OK with simple meals. For instance, yesterday I ate the salad I mentioned above in the Net Carbs section. The salad was only 3 ingredients – chicken, greens and avocado. Before, I would feel like I needed a fruit or something else to “dress it up”. This time, I stuck with what Atkins said (like a good girl) and it was plenty yummy and completely filling. CLICK HERE for a comprehensive list of all the foods you can eat in this 1st phase. 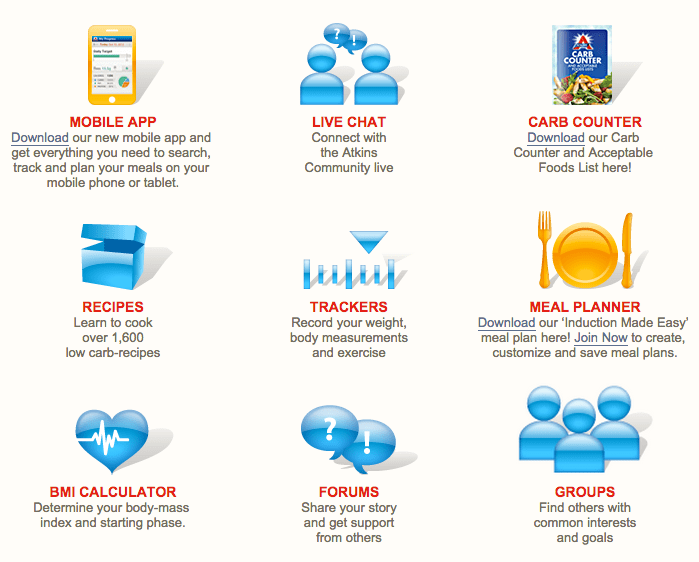 Atkins has free diet tools, including an online downloadable starter kit, mobile app, recipes, meal planners and trackers. Explore all the Atkins tools, tips & info at Atkins.com. Follow them on Twitter and Facebook to get more tips and news. Get recipes and other healthy ideas on their Pinterest. Here is a sample of my first week’s diet plan. Keep checking in for more tips and feedback on my Atkins diet experience!! I am logging my carbs, only lost 4lbs in 3 weeks. Staying under 40 carbs and in some cases under 30. Are you looking at calories as well? I think it came with it, however, I’ll be posting a 7-day meal plan very soon. Stay tuned! How are you doing on this? I came across your page and saw that you were doing this. I have really been struggling with my weight lately. Well actually for along time. I lift weights and do some cardio throughout the week. Any tips or suggestions? I actually log all my food in the LoseIt app. It helps me stay accountable and manage my weight. To me, it’s the most valuable tool! I do log my food in my fitness pal. However I started the Atkins on Thursday I did really good . I felt very satiated. I went to the gym on Friday morning and I was sent home by my trainer because I didn’t have any fuel or energy for my workout. No more Atkins. So, how did this work for yoy?